I’ve been writing about Simone Biles since 2013, when she made her senior international debut at the American Cup. She placed second there, in what wound up being one of the last second-place all-around finishes of her career, but she already displayed all the physical prowess we’ve come to associate with her: speed, kinesthetic awareness, acrobatic ability, and, of course, power. “Power” and its relatives “powerful” and “explosive” are among the most frequently used words to describe Biles and her brand of gymnastics. There’s ample reason for this. So, yes: it’s entirely apt. No one really flies higher or twists faster than the world and Olympic champion. That physical power was striking this summer when she returned to the sport after a yearlong hiatus following her five-medal haul in Rio, and appears only to be increasing. Just last week Biles busted out a vault no woman had ever completed before. But power comes in different forms. Since her return to gymnastics, Biles has become increasingly outspoken in general, and especially critical of USA Gymnastics and its choices. She knows her strength—she is the closest thing to untouchable in this sport of relatively short primes—and she’s showing a new willingness to use it. Over the weekend, Biles butted heads with USAG’s new interim CEO and president Mary Bono, a former Republican congresswoman from California. Shortly after Bono’s appointment was announced on Friday, gymnastics fans found a tweet from just last month in which Bono posted a photo of herself covering up the Nike swoosh on her shoes, after the sportswear giant announced an advertising campaign featuring Colin Kaepernick. It was a fad at the time among the sort of people who get upset about this sort of thing. Biles, a Nike sponsored athlete, responded with a tweet of her own. This is an athlete defending her sponsor, but it’s not just that. Biles also correctly noted that USA Gymnastics is hurting for sponsors because of its self-inflicted disasters of the last few years, which means it’s hardly wise for a new president to come out so strongly against one of the bigger brands in sports. So Biles had a point, but more important was that she had an impact. Within hours of Biles’s tweet and the ensuing media fallout, Bono deleted her tweet and apologized, claiming that she respects “everyone’s views & fundamental right to express them.” In just over a month, Bono somehow went from defacing Nike products because the company featured a black athlete who used his platform to protest the police murdering African-Americans with impunity, to saying that she really believes that people should have to the right to speak out. Bono’s September tweet was all the more egregious because she had just taken the reins of an organization that has been accused of stifling the voices and concerns of its athletes. Biles does not have the power to really get cornballs like Bono to change their minds. That she can make them turn tail with a single tweet, though, shows what she can do. I highly doubt that Bono experienced a true change of heart, but she clearly experienced the power of Simone Biles. Bono is the highest ranking officer in USAG, but Biles is the most powerful person in American gymnastics. Recent reckonings with sexual, emotional, and physical abuse in sports have revealed the extent to which athletes are defenseless in the face of overwhelming institutional and administrative power. This imbalance, as Han Xiao, chair of the Athlete Advisory Council, testified this summer at a senate committee about sexual abuse in Olympic sports, is at the root of the problem. In a system where the athletes have no power and are subject to the power of others, abuse will proliferate. This is due, in part, to the fact that athletes fear being retaliated against if they speak up. That retaliation can come in many forms—it can mean the loss of funding, missed promotional opportunities, and, most crucially, not making teams. Biles is the rare athlete who does not need to worry about that last part. 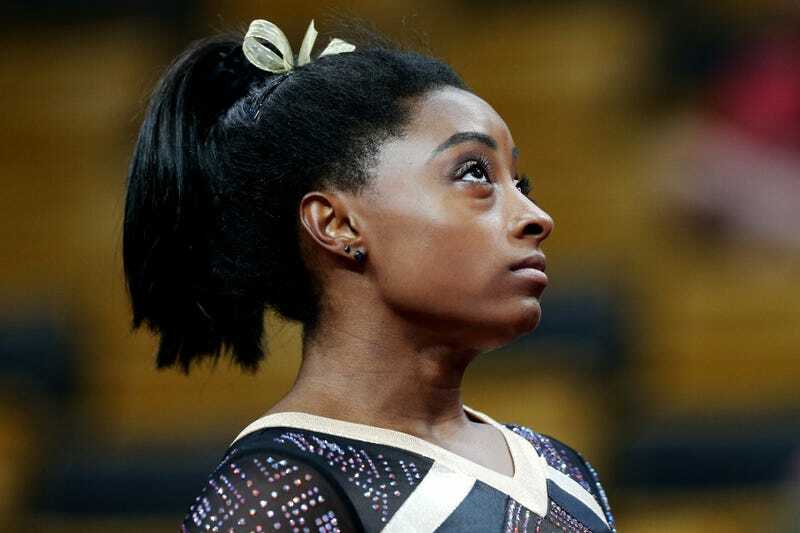 As long as she wants to compete and as long as she is healthy—or at least, healthy enough—Biles has a spot on the national team. Speaking up won’t jeopardize her position. This past weekend was hardly the first time that Biles has used her platform to speak out. Shortly after she revealed that she had been abused, she used social media to express her anguish at having to return to the Karolyi Ranch, where she had been abused, to prepare for the next Olympics. At the U.S. National Championships in August, Biles held court with reporters and publicly criticized the job performance of USA Gymnastics president Kerry Perry, whom Bono went on to replace. Biles, who in January added her name to the long list of athletes abused by Larry Nassar, also wore a teal-colored leotard on the second day of competition in a nod to victims of sexual abuse. Again, her words and actions made an impact. When she spoke out about the Karolyi Ranch, those training camps were almost immediately canceled. Her teal leotard made headlines and highlighted USA Gymnastics’ failure to do anything to acknowledge the survivors during the competition. Her tweet this weekend is part of that work. The reason that Biles possesses this kind of power has nothing to do with the changing culture of USA Gymnastics or its purported attempts to “empower” the athletes. It has everything to do with the fact that she is Simone Biles, and with her tremendous talent and unprecedented athletic ability. She is not simply the best female gymnast in the sport at the moment—she’s among the greatest and most recognizable female athletes in the world, regardless of sport. Almost anything she does or says makes headlines. She knows this. It’s been thrilling watching Biles make her return to gymnastics. With nothing left to prove—she has won everything, and some things more than once—Biles is now pushing the technical boundaries of gymnastics and showing us skills we’ve never seen before. It has been just as thrilling to watch her come into her power as something more than an athlete, and to wield it with confidence.